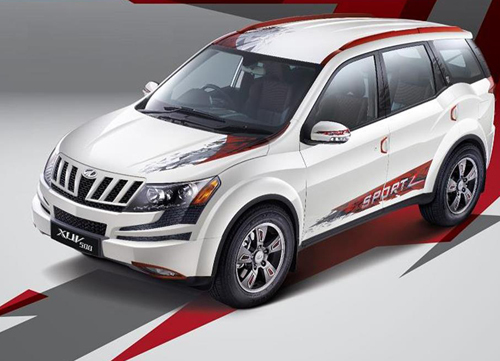 New Delhi: Mahindra & Mahindra (M&M) on Thursday launched a special edition of its sports utility vehicle XUV500, priced at Rs 13.68 lakh (ex-showroom Mumbai). The special edition--XUV500 Sportz, which has been built upon the top end model of XUV500, comes with various external and internal features including rear-view camera and leather-fabric seats. "This new offering of 'XUV500 Sportz' aligns with our leadership position in Indian motor sports and rallying and reflects our sporty DNA very well," M&M Chief Marketing Officer, Automotive Division, Vivek Nayer said in a statement. The company believes that it will create a new benchmark in exclusivity to further enhance the XUV500's appeal amongst customers, he added. The model comes with various high end features like electronic stability programme (ESP) with rollover mitigation, airbags and hill hold control and hill descent control functions. "XUV 500 has good acceptance in Punjab and Chandigarh and people here have passion for vehicles. That is why we launched here from Chandigarh," company's Chief Sales and Customer Care Officer, Automotive Division, Arun Malhotra told reporters in Chandigarh today. The company will also unveil XUV500 Sportz in Pune today. The company would roll out 1,000 units of this limited edition vehicle, he said. "This is the model we are launching is the top end model. And we are adding a lot of glamour to the vehicle. This is the limited edition for 1000 volumes. We believe that it will create a new benchmark in exclusivity to further enhance the XUV500's appeal amongst customers," he further said. "With this launch, we want that image and brand identity of XUV 500 to be further reinforced," he said. Since the launch of XUV 500 in year 2011, Mahindra and Mahindra sold 75,000 units of this vehicle so far. "In next 4-5 months, we aim to achieve sale of 100,000 units of XUV 500," he further said. "We are the fastest vehicle company to cross 50,000 vehicles sale which is priced above Rs 10 lakh," he said. Several cities and states like Delhi, Chandigarh, Punjab, Gujarat, Hyderabad and Bangalore are the strong and potential markets for XUV 500, he said. 'XUV500 Sportz' will be equipped with 140bhp (103Kw) mHawk engine with 330Nm torque and a 6-speed transmission.